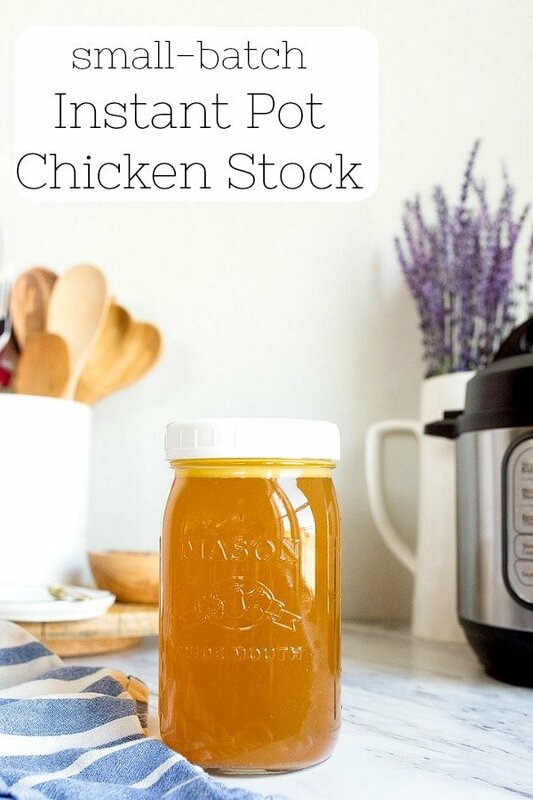 Instant Pot Chicken Stock (small batch). Would you be surprised if I told you that Santa brought me an Instant Pot for Christmas? Did you know they make a mini Instant Pot? It’s called the Instant Pot Duo Mini, and I feel like it was made just for me! 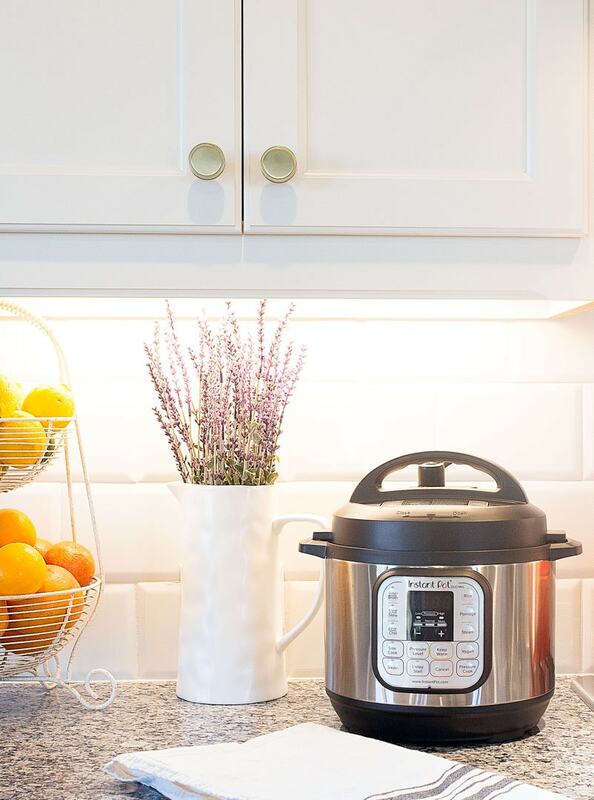 The Instant Pot Duo Mini holds just 3 quarts, and is specifically for smaller households looking to serve 3-4 people. Basically, I heard the phrase ‘small batch’ and jumped all over it. I spent an entire day reading the instruction manual, joining Instant Pot Facebook groups, and reading other bloggers’ guides on how to use this amazing machine. I truly loved Heidi’s guide the best. Heidi suggested to pick one function to master, and then go from there. I started with pressure cooking, because the real reason I wanted an Instant Pot is to make beans. I love love love beans—more than the average person. Before I had a baby, I would soak one or two varieties of beans each week, and slowly simmer them on the stove top. Looking back, I can’t believe I had so much free time! But, it’s true what they say about being a Mom–you have less time to accomplish the same amount of stuff, so you’re forced to be efficient with your time. Not wanting to give up homemade beans for canned ones, I knew the Instant Pot was my solution. The first two things I made in my Instant Pot were: a pot of chickpeas and a pot of black beans. My chickpeas were perfection at 15 minutes on HIGH after a 6-hour soak. However, I overcooked the black beans using the same method, so next time will be better. Anyway, another reason I was excited for the Instant Pot is to make stocks and broths of all kinds! 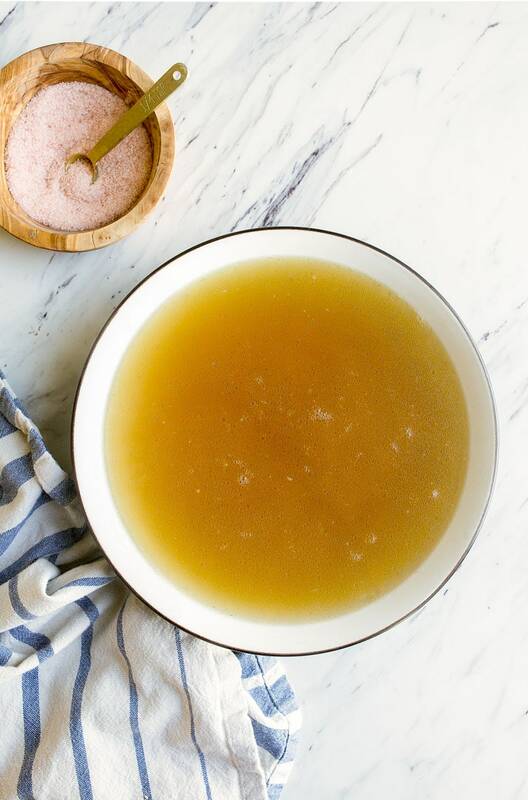 I’m a big believer in bone broth, both for our immunity and gut health benefits (seriously, the protein levels amaze me–I’m a borderline vegetarian, you probably remember). So, I had this vision of being able to make a small batch of chicken stock in the Instant Pot Mini while I was cleaning up the kitchen. Into the Instant Pot would go odds and ends from the fridge, and out would come perfectly flavorful stock to use the next night. I did just that. I tossed in 2 chicken thighs from a big pack of local chicken that I was portioning out into FoodSaver bags destined for the freezer. I added one carrot, two stalks of celery, one small onion (washed very well but not peeled–onion skin contributes color to the stock), a bay leaf, and two peppercorns. I heeded the instruction manual warning and only added enough water to come up to the max fill line. I popped the lid on, and set it to 30 minutes at HIGH pressure. One little note: after years of making homemade broths and stocks, I have learned to never add salt until the end. So, I made my stock, released the pressure, strained it, and then stirred in the salt. (My salt is pink because I’m a Himalayan pink salt cult member. Sorry). I used 1 teaspoon of salt for one quart of this instant pot chicken stock. Ok, friends, I just wanted to introduce you to my new little machine. 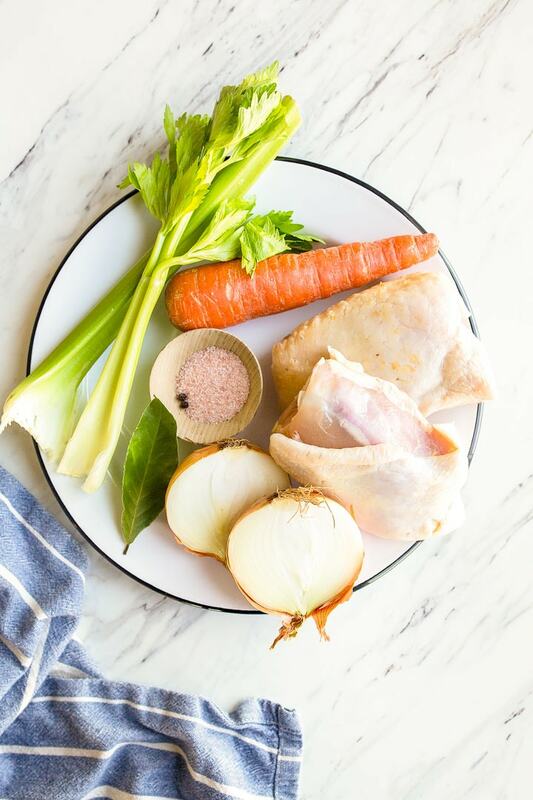 You’ll be seeing more small batch Instant Pot recipes for two from me soon, especially recipes that use this Instant Pot chicken stock as the base, because I think good stock is the foundation of good cooking. In the meantime, leave any requests in the comment section! I’m making a new category of recipes for the Instant Pot, but will still file them under my Dinners for Two section so they don’t get lost in all the sugar around here, ok? Add water to the max fill line. 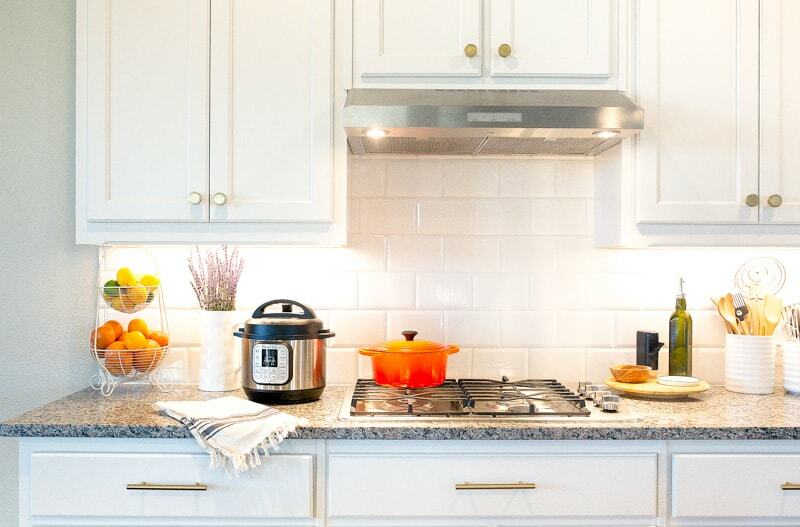 Place the lid on the instant pot, and lock it in place. Close the steam release valve (set it to seal), and then press 'manual.' Make sure it is on 'high' for high pressure. Use the arrows to set it for 30 minutes. After a few seconds, it will start pressurizing. (The countdown of 30 minutes doesn't begin until it reaches pressure, which can take 10-15 minutes). After the 30 minute cook time is up, you can manually release the pressure or let it naturally release (be careful!). Open the lid, and strain the mixture into a bowl with a pour spout, and discard the solids. Stir the salt into the broth until dissolved. 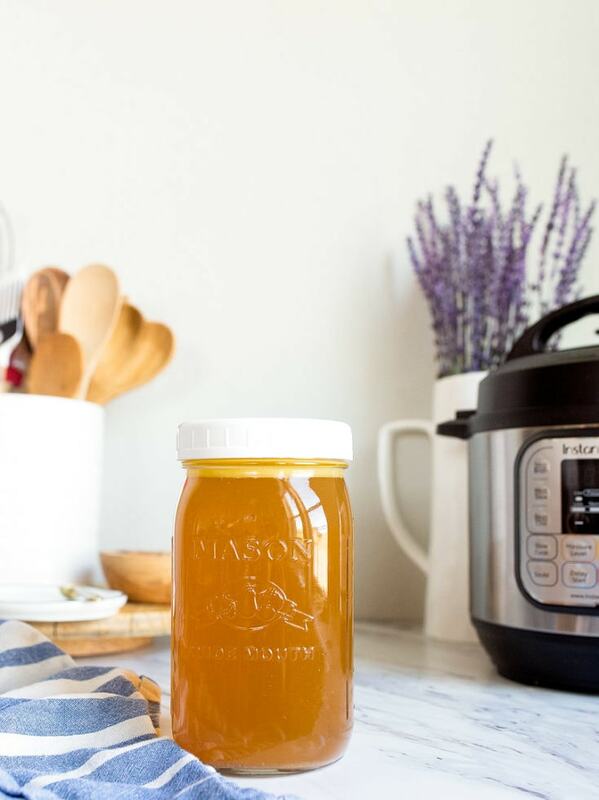 Pour the broth into a 1-quart mason jar container and store in the fridge for up to 5 days. (Or, pack it in freezer-safe bags, and lay flat in the freezer for longer storage). *Please read the instructions that accompany your pressure cooker before attempting any pressure cooker recipe! Do you have an idea of how one could cook this in a traditional slow cooker? Broke college student doesn’t have an instapot, but I do have a 2Q slow cooker, and I’d love to get some homemade stock in my life! I want to know how the yogurt setting works…that could be huge for me. Also I good rice pudding in the instant pot!!! Of all the recipes of yours I have made over the years this one is my absolute, all time, number one favorite. Never again will I have to do without broth on my whole 30 because I can’t find one without added sugar. You are my hero. Oh gosh, Julie! Thanks so much!! Yeah, I didn’t know all the hidden words for sugar on a label until recently. Sneaky! I, too, love beans and like you I prefer beans that have been pre-soaked. I was actually soaking/brining mine for 24 hours. Not that it needed it. It just didn’t hurt and fit my schedule a whole lot better. But then I read one of Gina of skinnytaste.com’s Instant Pot recipes where she “pre-soaks” beans in the IP before actually cooking them. It only takes about 15 minutes. You just put water, salt and the beans in the IP and pressure cook on high pressure in manual mode for 4 minutes. Let it stay in keep warm mode for 10 minutes and then remove and rinse the beans. Proceed from there to actually cooking the beans. I’ve found that black beans will then take only 15 minutes to cook. I’m still playing around with cooking times for other beans: 25 minutes was too long for pintos, for example. BTW, I love both your cookbooks. As someone who lives alone and cooks mainly for himself, they’ve been very valuable. Thanks! People get so excited that they don’t “have” to pre-soak beans when they cook them in the Instant Pot because it cooks so fast. Well, soaking and pouring off the soaking water are important steps to digestibility and helps with the gas beans are notorious for! I was curious as to the why of not adding salt during the making of broth. I have never heard of it. I have a larger Instant Pot, which means it takes more liquid to reach the max fill line. About how much water do you think you used in your mini?Thanks! I am so excited for the recipes to come! I just got an Instapot so I’m very excited to try this! My son is basically vegetarian. He loves soup so I’m excited to make some bone broth and yogurt so he gets extra protein into his diet! I’ve been contemplating doing your cheesecakes in an instant pot, but I’ll wait for you to do it since you’re way better at figure out how. Also keeps me from making cheesecake since i’m the only one here that eats it. Kids don’t know what they are missing!! I just made a batch of stock, took pictures to brag to my hubs, took a big slurp and it turned out crazy bitter. : ( Any idea what I may have done wrong? Should I have peeled the carrots? I left onion skins on too as I read somewhere else it gave the broth color. Will try again but was wondering if this happened to anyone else. Thanks, in advance! There are some interesting reasons why your stock could have turned out bitter (https://www.chowhound.com/post/fix-bitter-chicken-broth-922211). Esp the part about how long the veggies were in contact with the water, and what veggies/aromatics you used. I have the bigger Instant Pot and a bigger family…how would you scale this up to make a larger quantity? So looking forward to your instant pot recipes. I am only one person cooking and only have the 6 Qt pot. Don’t really want to buy the mini for another hundred dollars. Assuming I would just use the 6 qt for my recipes for 2 .
looking forward to your Beef bone broth in your Instant Pot. WILL YOUR RECIPE WORK IN A 4 QUART INSTANT POT ? I don’t think a 4-quart instant pot exists…It goes 3, 6, 8…correct me if I’m wrong. At last. Recipes for the Duo Mini. So many recipes are for the larger pots (to feed an army) so it’s great to have recipes for my lil’pot. My new baby (Ultra Mini) just arrived and I’m so glad I found your site. I’m wanting to do dried Lima beans, any idea on how long to cook them? Thanks! Borrowed my daughter’ 8-qt. Power Pressure Cooker XL and love it, but need something smaller. There are just two of us, and I’ve filled the storage space in my kitchen. Searched for a recipe for chicken broth in the little Instant Pot and there you were! Perfect! Now I can buy my own Instant Pot! I was debating between the 3qt or 6 qt. It’s just me, so only cooking for 1 person. Love that I found this recipe for broth in the mini pot. I feel the 6qt is just too big for one person. I am single and have the 6qt Instant Pot. I prefer it over the 3qt. The only real difference is the size. I cook most things pot in pot, but at leaat I have the option to cook a bigger batch of something, such as a whole chicken. Hi my name is danielle and I was wondering if instead of the fresh thighs could I use the bones from a previous roast chicken?